The site is located in a serene locality off the main road at Pollivakam in Sriperumbudur, taking you away from the noise and hustle bustle of the Thiruvallur to Sriperumbudur highway. A very prominent entrance with its lively play of colours and shadows promises a wonderful and worthwhile time to be spent at Vishwaksena School. You feel you have reached the heights of awe as you enter under the amazing cut-outs and pergolas with the shadows painted on the walls, there is more than this. 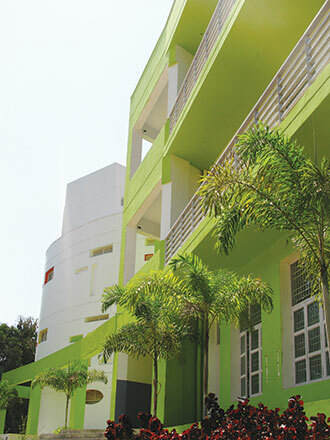 As you walk down the beautifully landscaped path to reach the admin block of the building, you just can’t miss the bright colour shades of green and white and yellows that play with your mind in addition to the greenery and landscaped surrounding. One can imagine how a child would be lost in the world of colours and shapes as the building itself reflects liveliness and activity among the children. When you are done looking up at the niches and shapes, down on the floor one finds numerous interesting lights and shadows created by the cutouts on the wall. It makes the child think of such possibilities and how different it looks from the usual concrete boxes that they are so used to seeing everywhere they go. One gets a feel of excitement, as if entering a theme park where they need to explore the space and satisfy their curiosity. There is ample sit out spaces on the window ledges and near the courtyard railings that allows a lot of interaction among the kids even as they remain under their teachers’ supervision. The buildings life emanates from its central elliptical courtyard that connects all its levels and provides a mesmerizing view from everywhere and lights up all the spaces connected to it. The courtyard brings nature inside the building and blends well with the colour and mood of the surroundings and keeps kids close to nature. It’s a suspense that opens out while entering the school main building. In the upper floors great care has been taken to ensure utmost safety measures without hindering a child’s view and play. Natural lighting has been to every nook and corner of the building and ventilation that promises nice breezy winds in the mornings and evenings. 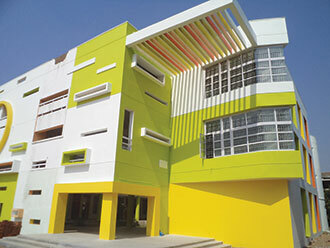 This is a boon to the atmosphere created at the corridors and classrooms. The design builds up an innocent simplicity in experience with simple elements and effective use of materials like paint on concrete and glass. Structurally it keeps us wondering how such a design can be conceived without imagining the building on a highly three dimensional scale. Even further inwards the design also shows how a curved wall has been treated beautifully with niches amongst which toilet ventilators were well camouflaged. The niche wall with its colourful bright patterns on a curved space extends three floors high and captures dynamism of a rectilinear and circular shape. The internal spaces classrooms, staff rooms, toilets and corridors also are well defined if not restrictive. Next How to Design Light Weight Concrete?